The best electric guitars under $200 reviewed by Know Your Instrument! The Best Electric Guitars Under $200 in 2019: reviewed and rated! One of the most challenging things budget-conscious musicians go through is finding the best electric guitar under $200. It’s easy to doubt the build, playability and sound quality of low-cost guitars because of the use of cheaper materials or the fact that most guitars in this price range are mass-produced in a factory somewhere. But musicians on a budget need not fear browsing through this price category because we’ve done the work and picked out the highly recommended models. Here are fantastic electric guitars from trusted brands Epiphone, Ibanez, Squier, Dean and Jackson. Now you can just take your pick! Epiphone SG Special Electric Guitar The Epiphone SG Special really is special because not only is it affordable, it’s equipped with twin open-coil humbucking pickups with ceramic magnets as well. These ceramic pickups are proven to deliver a higher output than pickups with traditional Alnico magnets. If your musical preferences lean toward hard rock and heavy metal, this is the Epiphone SG guitar for you. Squier Affinity Telecaster Electric Guitar Here’s a Tele you can own for $200. The Squier Affinity Telecaster is a fantastic choice for beginners and intermediate players looking for a quality instrument in this price range. Designed by Fender, the Affinity Series Telecaster is equipped with two vintage-style single-coil Tele pickups as well as a six-saddle top load Tele bridge for a more precise intonation. Ibanez GRX70QA Electric Guitar Next up is the Ibanez GRX70QA, a budget-priced electric guitar that doesn’t look and sound cheap. It has a poplar body with an eye-catching quilted maple art grain top, a maple neck and a treated New Zealand pine fretboard. It’s equipped with three high-output Infinity R humbucking pickups and a five-way pickup selector switch. It also has a tremolo bridge! 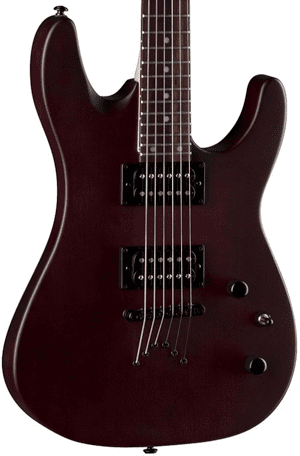 Jackson JS22 Dinky Electric Guitar It’s amusing how something so sharp-looking and a favorite weapon of choice among heavy metal and hard rock players is called Dinky, but that’s just one of the interesting things about our next guitar recommendation. The Jackson JS22 Dinky has an arched basswood body, a bolt-on maple neck, dual high-output humbuckers, a synchronized fulcrum tremolo bridge and pearloid sharkfin inlays. Dean Vendetta XM Electric Guitar Now we have an impressive guitar from Dean, the Vendetta XM. It has a sculpted body made of lightweight paulownia wood. Its bolt-on neck is made of maple and it’s topped with a rosewood fretboard with 24 frets and classic dot inlays. This Vendetta is equipped with dual humbucking pickups and a Tune-o-Matic bridge. It’s a versatile axe for everyone! Want an SG electric guitar for under $200? Look no further than the Epiphone SG Special, the most budget-friendly SG you can buy today. It’s got all the features musicians expect from an SG but without the price of an upscale model. 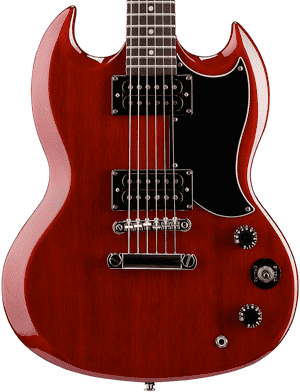 For starters, the Epiphone SG Special has a mahogany body paired with either an okoume or neck, depending on availability. The bolt-on neck has a Sixties-style SlimTaper D-shaped profile. The scale length is the same as that of the classic SG at a compact and comfortable-to-play 24.75 inches. Topping the neck is a granadillo fretboard with 22 medium jumbo frets and pearloid dot inlays. The Epiphone SG Special also has two open-coil humbucking pickups that feature ceramic magnets. There’s a 650R humbucker at the neck or the rhythm position and a 700T humbucker at the bridge or the lead position. Compared with vintage pickups with Alnico magnets, the twin ceramic humbuckers offer a higher output, making the guitar suitable for heavy metal and other rock styles. For controls, you get a three-way pickup selector along with Master Volume and Master Tone knobs. A KillPot switch is integrated into the tone pot and allows for a staccato effect. The Squier Affinity Series Telecaster offers incredible value for a Fender-designed instrument. 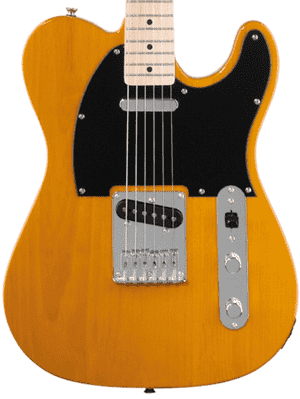 If you’re a beginner looking for a great starter instrument or an intermediate player itching to upgrade your guitar, consider Squier’s more affordable version of the classic Tele. The Squier Affinity Telecaster has a lightweight alder body with a classy polyurethane finish and a C-shaped maple neck with a smooth satin urethane finish. The fingerboard is also made of maple and it has 21 medium jumbo frets with black dot position inlays. This tonewood combination produces a bright, snappy tone with good sustain. A pair of vintage-style single-coil Telecaster pickups capture the guitar’s sound and deliver the iconic Tele tone. You can choose to use the bridge pickup, neck pickup or both pickups via the three-position blade. There are also master tone and volume knobs for tone tweaking. The Squier Affinity Telecaster also sports a six-saddle top load Tele bridge, which effectively reduces the strings’ break angle over the saddles and creates a more slinky feel. The individual saddles allow for a more accurate intonation for each string. The Affinity Series Telecaster is available in a number of finishes, including Butterscotch Blonde, Arctic White, Black and Slick Silver. 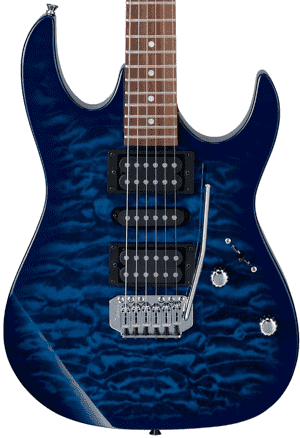 Part of the RX series, the Ibanez GRX70QA was introduced in 2011 and has undergone a few changes over the years. One of these is the fingerboard material. Because of the import restrictions on rosewood, the Ibanez GRX70QA guitars produced from 2017 now have treated New Zealand pine for their fingerboard. Specs may also vary depending on the market and retailer stocks. Here we’ll take look at the specs that come standard with the Ibanez GRX70QA models produced from 2015 to 2019. This electric guitar has a poplar body with a quilter maple art grain top. The bolt-on neck is made of maple. The pine fingerboard has 22 medium frets and white dot inlays. The GRX70QA is available in a number of finishes, including Transparent Emerald Burst (TEB), Transparent Red Burst (TRB) and Transparent Blue Burst (TBB). 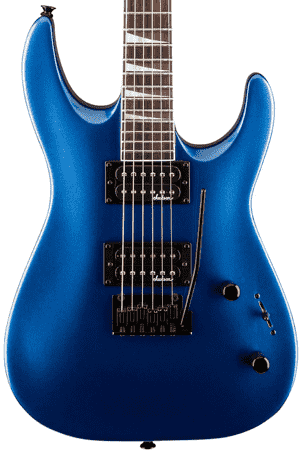 The Ibanez GRX70QA has an HSH pickup configuration, with Ibanez Infinity R humbucking pickups at the neck and bridge positions and an Ibanez Infinity RS single-coil pickup at the middle position. There’s a five-way lever as well as master volume and master tone controls. A T106 tremolo bridge gives you more control over your pitch and allows for a more diverse sonic output. Why is something that looks like it can kill someone called Dinky? Well, the Jackson Dinky is called such because it has a 7/8 body size, making it an ideal instrument for players looking for a smaller-than-normal guitar. But while it’s just a bit smaller than average, its scale length is at 25.5 inches, which is considered standard (not short-scale). Like other Dinky guitars, the Jackson JS22 Dinky has a body shape similar to that of a Fender Stratocaster. It has an arched basswood body and a bound one-piece bolt-on maple speed neck with graphite reinforcement. Topping the neck is a smooth rosewood fingerboard with 24 jumbo frets and white binding. The position markers on the fretboard are classic pearloid sharkfin inlays. The JS22 Dinky is designed and built not only for speed but also for aggressive music and playing styles. This Dinky can definitely keep up with any form of shredding or whatnot, thanks to its high-output Jackson humbucking pickups at the neck and bridge. It’s easy to choose your humbucker of choice (or both) via the three-position blade selector. The Jackson Dinky JS22 also has a two-point fulcrum tremolo bridge and Jackson sealed die-cast tuning machines. Well, paulownia is an extremely lightweight hardwood that looks like ash and is a popular substitute to mahogany as a guitar body wood. The fastest-growing hardwood species on the planet, it grows in Asia and has been used for centuries in making string instruments such as the Japanese koto. Because of the rising costs of traditional tonewoods as well as the restrictions on their importation, guitar manufacturers such as Dean Guitars have turned to alternatives such as paulownia. Since paulownia is super light, it makes the Vendetta XM lightweight too, making it a good choice for beginners and young players. As a tonewood, it is tonally similar to swamp ash. It’s highly resonant with a tight low end. The sound is captured seamlessly by the two open-coil Dean humbucking pickups, wired to master volume and tone controls and a three-way pickup toggle switch. This guitar also has a Tune-o-Matic bridge. Here’s the reality of things: A good guitar costs money. A really fantastic piece of equipment costs more. This is what potential buyers should know before buying an electric guitar. You get what you pay for. This is not always the case, of course. There are instances when you find a guitar that costs a lot less than expected. In this list we’ve picked out some electric guitar models that look, sound, feel and overall perform well above their price point. Appreciating the qualities of sub-$200 guitars depends heavily on knowing what to expect and managing those expectations. It would not be fair at all to compare a $200 guitar to one that costs $1000 more, even if they look the same. There are a few novice players who start out with an entry-level model and complain that it doesn’t sound anything like the Fender Telecaster Jeff Beck played. Of course it doesn’t – the materials and components are different. The skills probably aren’t the same either. We hope you avoid making the mistake of making unrealistic expectations of an inexpensive electric guitar. It may take years of experience – and lots of guitars – to realize understand and accept the differences among all the models out there on the market, but it’s bound to happen. By then, we’re certain you would be the one educating the latest generation of aspiring guitar players about what to look for in a beginner guitar and what to expect from guitars at different price ranges. For now, let’s take a look at some of the things you can expect when buying a guitar in the $200 price tier, especially if you’re buying online. This will help you decide on which guitars would be a good buy and offer great value for the money. Expect that it would not be totally playable right out of the box. Guitars that are ordered online do not always arrive at your doorstep completely set up, in tune and ready to play. Sometimes you can get extremely lucky and get a guitar that was freshly set up (and that the setup fits your playing preferences to a T) before it was shipped, and that shipping conditions allowed the guitar to stay in tune. But this is rare. Often the guitar would arrive out of tune, the action too high or with some string buzz. Some components may feel loose. This is normal. You have to understand that guitars bought online go through a lot before arriving at the delivery address. They’re picked from the stockroom or warehouse where a cursory check would be done before they’re packed up for shipping. It’s during shipping that they may get jostled, subjected to changes in temperature and humidity and so on. This is why it’s often recommended to have your new guitar professionally set up as soon as you can. A guitar tech can see to issues such as incorrect intonation, a too-high or too-low action, fret buzz and more. Expect the strings to break when you least expect. Guitar strings don’t last a lifetime, especially if you play on a regular basis and even if you do your best to clean and maintain your strings. Even new strings can break unexpectedly. This is just one of the realities of playing a guitar. Electric guitars under $200 come with stock strings that have probably been strung there for months, probably even years. Stockrooms and warehouses don’t always provide the best conditions for making sure guitar strings don’t rust. When a string breaks, it’s not your fault. The guitar isn’t to blame either. String breaks happen unexpectedly, even on the best high-end models. This is why one of the best things you can do to make your new guitar sound good right off the bat is to change the strings. Expect the guitar to go out of tune, especially if it’s new. When you change the strings on your new guitar, you can expect it to go out of tune often. Strings take time to stretch and settle, so give it time and practice patience. Tune and retune as needed. Going out of tune is not the fault of the guitar, unless of course the tuners are loose or there’s something wrong with the bridge. If you suspect this is the case, take your guitar to a guitar tech to be checked. Expect the guitar to have a few blemishes and factory setup boo-boos here and there. It’s not uncommon for guitars under $200 to be built in a factory or big manufacturing facility, as guitars in this price range are usually mass-produced. Though these guitars go through quality control, they may not receive the same attention as those belonging to higher price brackets. This is why some guitars arrive with some cosmetic blemishes such as stains and nicks or unfinished frets, a few loose screws, a missing strap button or whatnot. If you receive a guitar with issues such as these, take a moment to think about the extent of the problem. Can it be solved by a simple swipe of a cleaning cloth or a minor adjustment? Or is it something that calls for a refund or return? Is the issue a functional defect or the result of careless handling? Whatever is the case, our advice is to take the guitar to a technician for a proper assessment before taking action. For beginners getting a guitar for the first time, this is actually a must. Guitars at the $200 price point aren’t bad at all. When you take these points into consideration and manage your expectations, you may even realize that the guitar you get is worth a lot more. You may be pleasantly surprised at how good a guitar actually feels, looks and sounds in person. We’ve carefully selected the electric guitars on this list to show you just how great budget-friendly models can be, considering their price. We hope you find the right one for your needs and preferences. May it exceed your expectations!